CHAMBERSBURG - Day 1 is always a learning experience. 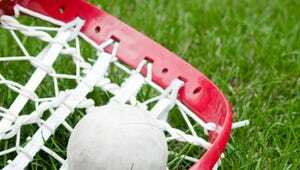 Chambersburg's girls lacrosse team did a lot of learning Thursday night. The Trojans are already looking for ways they can improve after suffering a 25-7 non-league loss to New Oxford in their season opener. "We're still a young team, but we like to play these challenging teams, because we can play up," Chambersburg coach Katie Feairheller said. "If it was a weaker team, we would probably play down to their level, so I'd rather see the girls playing up and working to try to get stronger." The Trojans (0-1) played well early on, pulling their deficit to just 6-4 midway through the first half. But then New Oxford (1-0) took a timeout, and it was all Colonials, all the time. New Oxford scored the next 11 straight. "Our offense is very fast, and we have at least six or seven different offensive threats," Colonials coach Jessica McIntyre said. "We like to see a lot of touches and like to have a lot of assists. We have a lot of speed in the midfield, so we look for the fastbreak. We're working on our defensive transition, but the offense is there." The double-figure halftime lead actually led to something crucial for the Trojans - it allowed New Oxford to slow down its offense, and Chambersburg some time to start making those improvements. Several times near the cage, the Colonials looked for the pass instead of netting a goal, and it led to multiple steals for Chambersburg's Liza Ernst. Backup goalie Micaela Champion, who was subbed in after an injury in the first half, also had a handful of point-blank saves to keep the score respectable. "We need more communication, and we need to learn where you need to be on the field to help each other out," Trojan senior Kendyl Stewart said. "We also have to not be so fast-paced with everything. You gotta think about what you have to do rather than freaking out and going for something that you might not know will work."